Explore las gemas menos conocidas de Venecia en este recorrido a pie de 3 horas. Dirigido por un guía, pasear por los puestos de productos frescos en el mercado de Rialto, detenerse en un osteria para tomar una copa de vino y unos pocos cicchetti (aperitivos venecianos). Diríjase a los históricos distritos de San Polo y Cannareggio, y cruce el Gran Canal en un paseo en góndola. Reúnase con su guía en Campo San Bartolomeo para comenzar este recorrido a pie de 3 horas, comenzando con un paseo por el Mercado de Rialto, lleno de productos vegetales frescos y mariscos. Después de deambular por los puestos, siéntate en una osteria cercana para tomar una copa de vino y degustar cicchetti (tapas venecianas). Después, súbete a una góndola para dar un paseo por el Gran Canal. Aventúrese a pie por el distrito de Cannareggio para ver una de las iglesias más antiguas de Venecia, que data del siglo VII. También pasará por el área de Castelletto, conocida como el barrio rojo de la época medieval. Continúe por el barrio de San Polo y admire el palazzo dei Camerlenghi del siglo XVI adornado a lo largo de las orillas del Gran Canal. A pesar de su hermoso exterior, el palacio fue una vez muy temido por los pequeños criminales durante sus días como prisión de evasores de impuestos. Luego de tres horas de turismo, su recorrido concluirá por el Puente Rialto. This ended up being a private tour as our group of 4 were the only ones. The guide was really informative and entertaining. We loved the market place. The glass of wine and selection of 2 nibbles each at the end was a nice finish to tour. My wife and I loved this tour! It ended up being just the two of us and our tour guide Georgia. You could tell she loves what she does and loves Venice and wants to share it with others. She took us to places we never would have found by ourselves. Our guide was amazing. She was so sweet and extremely knowledgable. We totally enjoyed our time. Great way to see a different side to Venice. We had a group of 4 which was great. Very informative. Enjoyed it. Worth doing. The walkabout was interesting but felt more fun could have been had with the Cicchetti and wine. Only one stop for this as opposed to what seemed should have been multiple stops. With only 3 days in Venice and being seasoned travellers, we opted for something a little less touristy. Very difficult in a city that is virtually wall to wall tourists. Had a very good fortune to meet Cristina at exactly the spot indicated on the instruction. This day were a smaller group only 6 guests, so Cristina got to know us on a first name basis making us feel we were on a private tour. Over the next 4 hours our guide demystified and painted a fascinating picture of Venice, it's people, it's history, and it's status as a city that's a living museum. Highly recommend this tour and more importantly Cristina who really made this special. Would have been great I am sure but unfortunately we missed this tour and I couldn't write a review without giving a rating. We allowed 45 minutes to make the 20 minute walk to the meeting point but Google Maps and I became very confused. I led us in a wide circle that ended no where near the starting point. When I rang the tour company to say we wouldn't make it, they very kindly tried to arrange a meeting point with the guide on the tour, but this was too hard to coordinate. I very much appreciate them trying though. 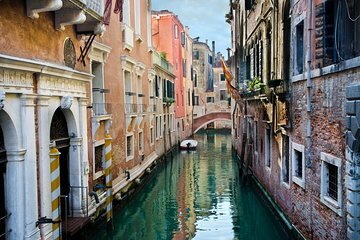 I strongly suggest purchasing a 3 paper map of Venice rather than relying on Google Maps if you need to be at a particular place and time as the narrow walkways and high buildings apparently interfere with the Google Maps signal. Excellent tour in every way! Highly recommend this one. Fabulous! Gina, our guide was great and so funny! Loved this tour and our guide provided so much history. See the Rialto Market in progress and learning about the area was amazing included the finale of our special treats and wine. Would definitely recommend.